Pics Of The Day: The Moment You're Marrying Someone From Edo State. Lolz, can't stop laughing... even in this century one would recognize the red beads of the Edo's, its their culture. 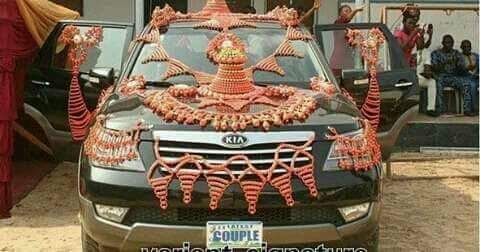 Am being serious, this is what your wedding convoy would look like if you marry someone from Edo. No hate feelings here, the bead work are always creative but at times funny... lwkmd. Don't let me pee on my pants today.